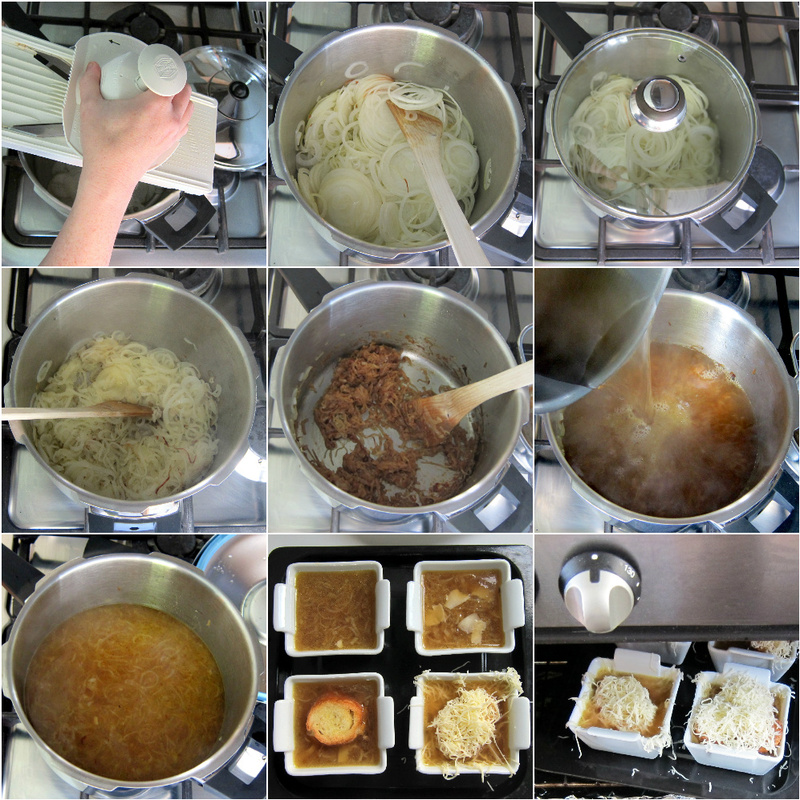 It was during the Soupe a L’Oignon (Onion Soup) episode that I realized that there are couple of things that could go wrong if one tried to make this recipe, as demonstrated and written, in the pressure cooker by only reducing the cooking time. Thickening – In the traditional method, Julia Child throws in some flour and butter right after caramelizing the onions to give the soup a nice body. Unfortunately, thickening with flour, starch, puree or flakes before pressure cooking will “solidify” most of the liquid that needs to boil and make vapor to reach pressure. This could either result in the pressure cooker not reaching pressure at all or, if it does, spurting thick liquid instead of vapor when pressure is released. HOW TO DO IT: Add the thickeners after pressure cooking. In this recipe, I cook the butter and flour in a little pan separately. When the soup is finished pressure cooking, I whisk this mixture into the pressure cooker and simmer everything together. 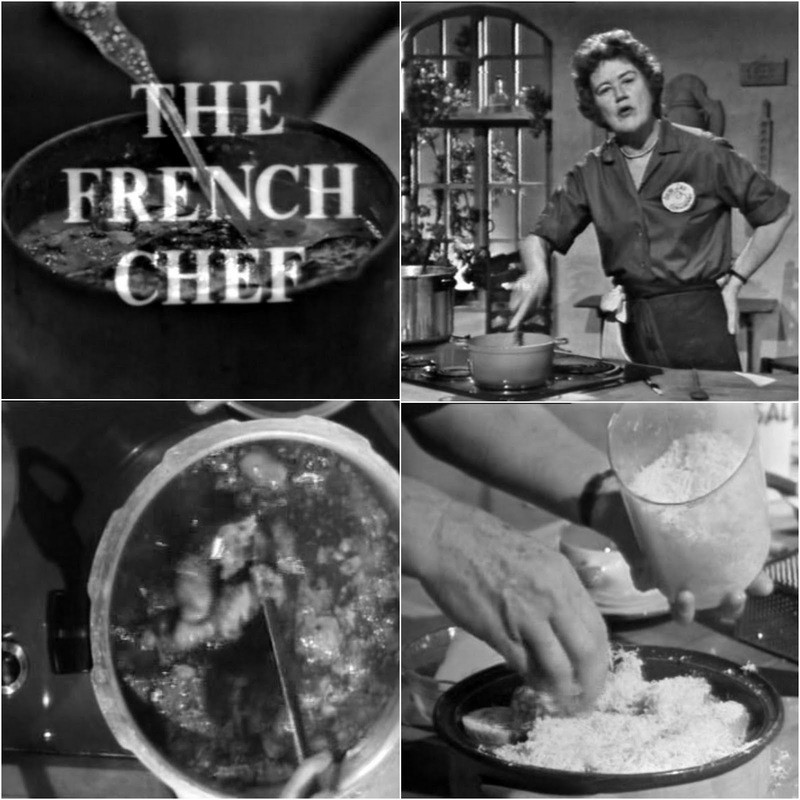 Flavoring with Wine– In the traditional method, Julia Child pours in 1 cup of wine to boil, simmer and eventually evaporate it’s liquid in the soup. Unfortunately, wine will not evaporate while boiling under pressure. The wine will remain as fully flavored and tangy as when it was first poured in the soup dominating the flavor and leaving an unpleasant effect..
HOW TO DO IT: Reduce the quantity of wine and fully evaporate it before pressure cooking. In this recipe, I use the wine to de-glaze the onions and evaporate it almost completely before adding broth. The wine will leave its essence without eviscerating the caramelized onion flavor base. Finally, in pressure cookerizing Julia’s recipe, the softening and caramelizing steps should still be done without pressure, but all of the simmering and boiling can be done under pressure. The more thinly you can slice the onions the faster each step not under pressure will go. A good mandolin is indispensable for this recipe – giving you paper-thin slices and cutting the time to caramelization in half from the original recipe. To save even more time, I slice the onions directly into the pre-heated pressure cooker into the simmering butter and oil. In the pre-heated pressure cooker, on medium-low heat, add the butter and oil. Soften the onions, stirring occasionally in the pressure cooker covered with a normal lid or pressure cooker lid set at NO PRESSURE until the onions become translucent (about 15 minutes). Then, turn down the heat to low, without a lid, add the salt and sugar and stir frequently until the onions have turned a uniform brown (about 10 to 15 minutes). In a small, separate pan, make the Blonde Roux by adding equal amounts of butter and flour and stir them on medium heat until all of the butter has melted and the flour begins to foam (this means it’s cooked), continue stirring occasionally and watching carefully until it turns a nice tan color. Turn off the heat and set aside. Back to the pressure cooker, de-glaze the caramelized onions with the white wine and let it evaporate completely. Then, add the meat stock. Close and lock the pressure cooker. Turn the heat to high until the pressure cooker has reached HIGH pressure . Turn down the heat and begin counting 5 minutes pressure cooking time. When time is up, turn off the heat and open the pressure cooker using the Normal method – press the button, twist the knob or lift the valve. Taste and adjust for salt and pepper seasoning then put a soup ladel’s worth of soup (about ½ cup) into the little pan with the roux - flour and butter mixture - and whisk together. Pour the mixture into the pressure cooker, on medium heat without the pressure cooking lid, and simmer together for a few minutes. Turn off the heat, and add Cognac and finely grated fresh onion wedge. Pour soup in individual soup bowls or serving tureen. Sprinkle the soup with cheese chips, then covering with toasted French Bread slices, then covering those with generous amounts of grated cheese. Slip under the broiler until the top is cooked and golden (2 to 3 minutes). This recipe can be halved or doubled without changes - providing the liquid does not exceed your pressure cooker's maximum capacity. OMG, that looks soooo good! Plus, I’m definitely adding a mandolin to my Christmas list. Thank you for so many tips and tricks in the kitchen… not just with my pressure cooker. Thanks Suzanne, You can also see Jaques’ programs on YouTube, and his daughter follows in his pressure cooking tradition –and avid reader of this website! I love Julia and I love my pressure cooker. I’m so sad one of them is gone. Good teaching about recipe and cooking technique translation for pressure cooking Suzanne! Will have to try this. I love my pressure cookers. Thank you for a terrific post. Jen, I know what you mean – at least for Julia! Sally, thanks! I will see if I can’t find another classic to convert to demonstrate more things to watch out for. I have loved my pressure cooker for years! Thanks so much for the tips! I just started pressure cooking, got my new cooker yesterday and make swiss steak, turned out great. I look forward to trying this recipe. Thanks much! Please consider making a ‘how to adapt recipes for pressure cooking’ post at some point. I was planning on making Julia’s onion soup tomorrow, and thought I’d try to convert the recipe to my pressure cooker. Then I thought, I bet someone has done that and blogged about it. I went through many recipes that didn’t bother with carmelizing the onions or using wine, then came to yours. Thanks for posting this! I appreciate being able to follow in your footsteps and the great tips. I can’t wait for tomorrow, now! This was a wonderful recipe. Easy to make, quick and delicious. I used dry sherry in place of cognac. My family loved it. Restaurant quality and very economical. Will make it again and again. Thank you for sharing! The soup was super delicious! We skipped the final steps i.e. no cheese or bread but it was still very filling and yum! Thanks for reporting, back. So glad to read you enjoyed it! The executive summary says prep 20, Cook 15 Total 35 min. But the text has preheat, Cook covered 15 min. Add stuff. Cook uncovered 10-15 min. Bring to pressure. Cook 5 min. release pressure. Add stuff. Simmer a few minutes. Add stuff. Broil 2-3 min. All those cooking times add up to a lot more than 35 min total and I haven’t even figured in the prep time yet. Done. and Excellent. I used “sherry” (apero) in lieu of cognac. Otherwise as per recipe. Don’t tell Pam I used the mandolin. She hates that gadget. Another oddity: This is not listed in the Recipe Index…By Course… Soups & Starters. Nor are a lot of other recipes that come up under a search for “Soup”. I knew I had seen it, but couldn’t find it at first as I used the menu system this way. Thanks for the feedback Greg, this is one of my earlier recipes so it needs a little neatening-up. I haven’t tried this recipe yet but have made French Onion soup before. Won’t yellow onions make it too sweet? Made this in my instant pot tonight. I can’t control the saute temperature so the onions softened and caramelized all at the same temp. It still turned out perfectly. So delicious. This was super easy and delicious. I skipped the cognac because we didn’t have any. This was the first time I’ve ever made French Onion Soup and not only was it delicious, but it worked perfectly in the Instant Pot! I used dry sherry. Thank you Laura! At your convenience, I”d sure appreciate the nutrition information on this recipe. Thanks for asking so nicely. I have added the nutritional information. If you don’t see it, make sure to re-load the page. P.S. Let me know if this is missing in any of the other recipes you’d like to try. Love your site, Laura! Your cooking school was just what I needed to get started with my new Instant Pot. French onion soup is a recipe my family enjoys, used our old family recipe in Instant Pot, took the direction from this one to cook 5 minutes, and voila–like we’d simmered all afternoon! We don’t use a roux and we don’t broil the cheese–just grate onto bowl atop bread, then put a tablespoon of hot soup over to speed the melting process, so for us this was truly a one-pot instant meal!